Today I tried out the Whitening Lightening gel kit that I’ve seen posted online everywhere! I decided to try out videoing my review and see how you guys found it. A word of warning that I am just using my laptop video and microphone so please don’t get mad at the terrible sounds! I just wanted to see how it went and thought I might aswell share my results with you guys! I didn’t actually give much of an analysis of what I thought of the product at the end so I’ll try and be more thorough in my description here! I’ve seen many reviews, mainly video ones, online raving about this product. I am giving my honest opinion on it, and how it worked for me may not be for other people but I’m being 100% honest!! Here’s the video if you fancy a watch – and let me know what you think! If you’d prefer see what I’ve wrote about it keep scrolling! So to begin with I’ll talk about the order. 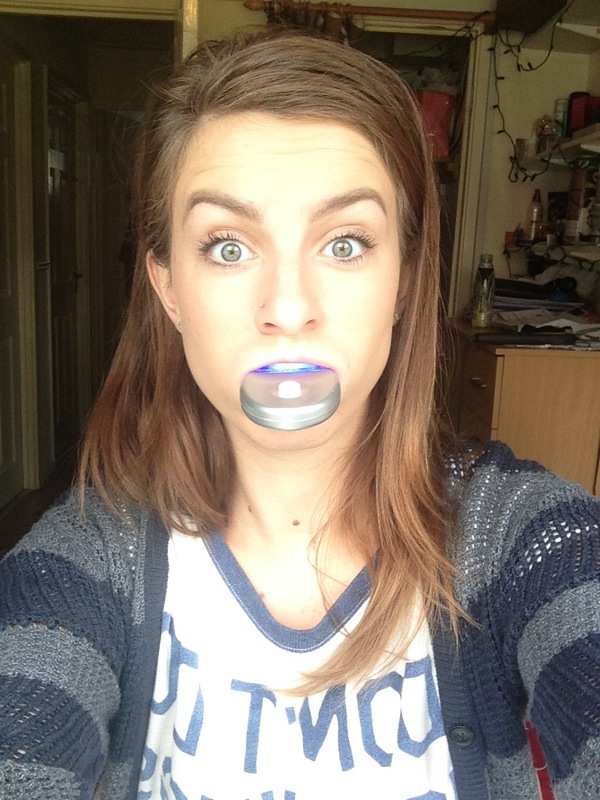 I went on the official website and ordered the Bright Express Teeth Whitening Kit. I bought this one because it was on sale and worked out costing me around only £13! Bargain! 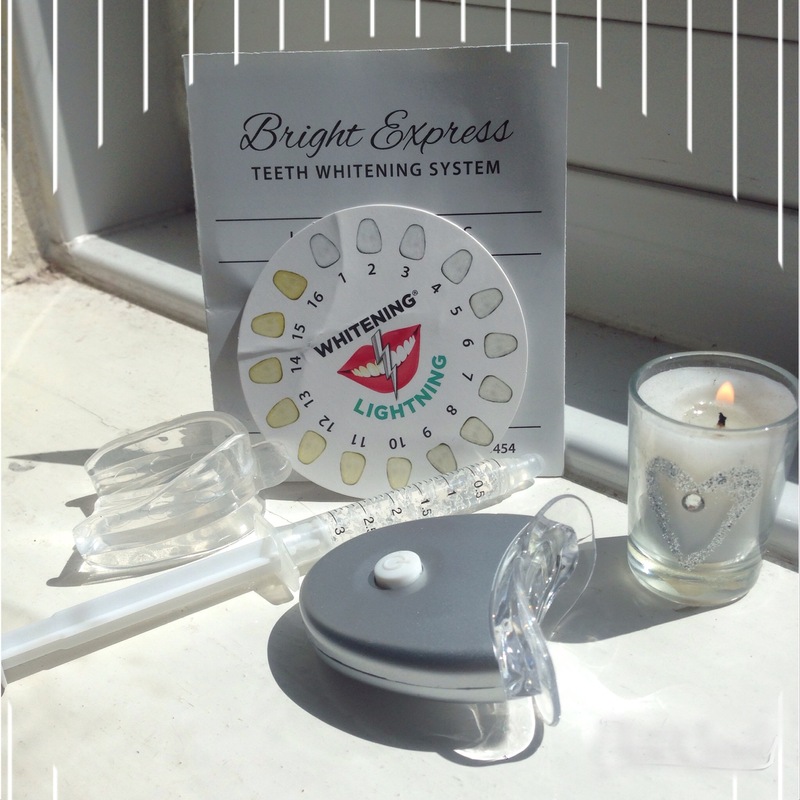 What I did receive was a little instruction booklet, the teeth colour dial, the LED light, a jelly-retainer thing(! ), and the 3ml of 16% hydrogen peroxide gel in a syringe. I’m not entirely sure if I did it right or not because i ended up sticking the light in my mouth but it said on the instruction to ensure it was at least 2 inches close – but doing this could have only worked in my favour so I don’t believe it changed the result! Originally I was between a 9 & 10, and I think it took me down to between a 7 & 8. Not a great improvement – I’ve seen people online with much better results but maybe my teeth just aren’t naturally white! If you watch the video you’ll see that I only did my top teeth, but later on I used the remaining 2ml to do the whole thing again incase this scurred the results, but my teeth didn’t get any lighter 😦 They just whitened my gums even more eugh! The application was quick but having it on was painful!! I definitely recommend buying the kit with the Vitamin E swabs if you are to purchase it because it did really hurt and I’m a bit worried I’ve damaged my gums from it! 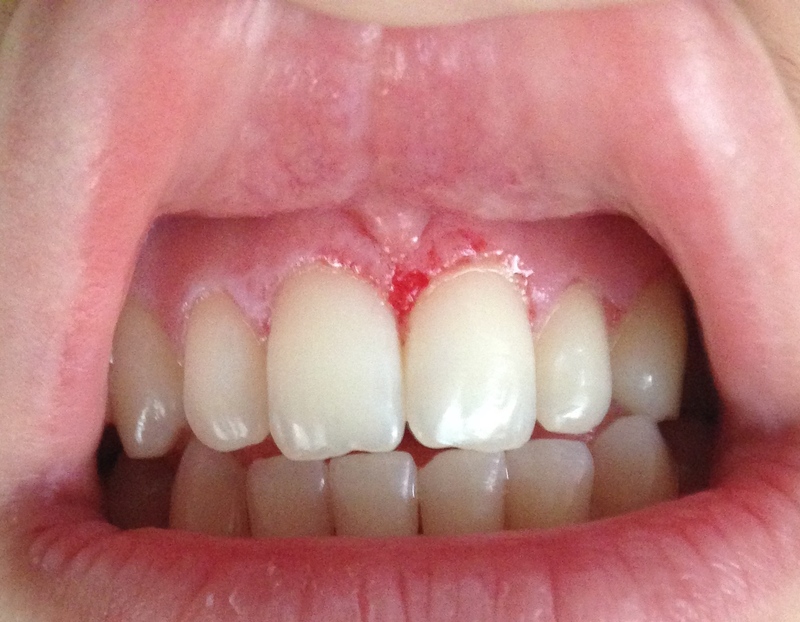 My mouth kept frothing up loads and I had to use tissue upon tissue to get rid of the excess! Everytime it came out, my mouth would then slowly start to build up with air again until my cheeks were puffed out and I had to let more foam out! Maybe if I hadn’t had the light in my mouth it would’ve be easier for me but I don’t really see how it was meant to work with the light being out of my mouth?! Apologies, I got all caught up in my videoing and forgot to take before and after photos! It did improve my teeth a little, and for £13 I’m not complaining. I would recommend it to a friend if they just wanted a subtle improvement, however if you’re expecting big things from this product then you’re looking at the wrong item! If I’ve left anything off that you want to ask please feel free! And if you’ve tried this kit let me know what you thought!